Ticketgum.com welcomes you into the world of sport. Ordering your Inter Milan tickets is only a few clicks away. We have saved you the best seats in the house, so you can cheer along with all the loyal fans of Inter Milan at the stadium. Our Secure booking process, low tickets prices, and highly trained customer service staff, will make your journey to the match feel easy, safe and pleasant. * Book Official Inter Milan Tickets Now! * Inter Milan Tickets Have High Demand, Don't Miss The Opportunity. * Inter Milan Tickets Are 100% Guaranteed. Inter Milan Football Club, more commonly known as F.C. Internazionale Milano or “Inter” for short, is a professional Italian football club based in Milan, Italy. The team is one of the most popular teams in the world and are well renowned to have never been relegated from the top-flight football league in their history. Inter Milan was founded in 1908 under the name of “Football Club Internazionale”, following the split with the Milan Cricket and Football Club (now A.C. Milan). The name later became “Internazionale”, which would be the first of many name changes over the years for Inter Milan. The club started off on a good foot, winning their first championship in 1910, but the second didn’t follow until 1920. In 1922, the team reached Group B of the CCI First Division but finished in last place after picking up just 11 points in the entire season. However, they managed to stay in the Italian top league after successfully winning two salvation play-offs. In the late 1920s, during the Fascist era, the club was forced to merge with Unione Sportiva Milanese and, as a result, went through a number of name changes over the course of the 1930s as the management changed hands. This disruption within the team didn’t leave the team with much luck, as it wasn’t until the 1938-39 season that the team won their first ever Coppa Italia. Finally, after the end of the Second World War, the club re-emerged with their original name: Internazionale and went on to have many successes. In 1960, Helenio Herrera joined the team from prestigious Barcelona, bringing with him the talented Luis Suarez who won the European Footballer of the Year the same year. Soon after his appointment, it became clear that Herrera would transform Inter Milan into one of the greatest teams in Europe through modifying the 5-3-2 tactic. In their first season at the club, the team finished third in the Italian Serie A, second the next and first in the third season, followed by two consecutive European Cup victories in 1964 and 1965. It was his performance during this time that the nickname “Il Mago” (the magician) was coined for Herrera. In the 1963-64 European Cup, “Internazionale” made the final where they played the highly-successful Real Madrid. Despite this, Inter Milan went on to win 3-1, as well as the Intercontinental Cup the same year over Independiente. The results repeated themselves for the second year running in 1964-65, beating Benfica in the European Cup and winning the Intercontinental Cup again over Independiente. Following the golden era of the 1960s for Inter Milan, where they changed their name back to "Football Club Internazionale Milano", they managed to win their 11th league title in 1971 and their 12th in 1980. During the 1970s and ‘80s, Inter went on to win another two Coppa Italia trophies in 1977-78 and 1981-82. Following their success, the 1990s was a period of disappointment for Inter Milan, whilst their rivals Milan and Juventus were having success domestically and in Europe. The team had a string of poor results, with their worst coming in 1993-94 when they finished just above the relegation zone. Despite this, they did achieve some success in Europe, with three UEFA Cup wins in 1991, 1994 and 1998. The early 2000s once again didn’t result in the best results for the team – and it didn’t help that rivals Milan were having a successful run, including beating Inter Milan 6-0 in the 2000-01 season. However, things began to look up in 2002 when they made it to the UEFA Cup semi-finals and became close to winning the championship. 2002-03 saw Inter finish in 2nd position and made it to the Champions League semi-final the same year. In 2004, Inter Milan announced the signing of former Lazio boss, Roberto Mancini, as the new head coach. In his first season, the team won an impressive 72 points from 18 wins, 18 draws and just 2 losses. In 2005, they went on to win the Coppa Italia as well as the Supercoppa Italiana – the first win since 1989. A year later, in May 2006, Inter retained their Coppa Italia trophy once again and won the Serie A championship after Juventus and Milan dropped points due to a match fixing scandal. In the 2006-07 season, Inter went from strength to strength, embarking on a record-breaking winning streak of 17 consecutive victories, which lasted for almost five months. That season, unsurprisingly, the team went onto win their second championship title in two years. However, after a good start to the 2007-08 season, domestic form took a turn for the worst. The club sacked Mancini and replaced him with Jose Mourinho in June 2008. His first season went well, winning the Italian Super Cup and the league for the fourth consecutive title, becoming the first team to accomplish this. But European success wasn’t good for Inter, after being knocked out of the first round for the third time in a row. 2009-10 looked better for the team, who went on to win the Champions League final, as well as the Serie A and the Coppa Italia: winning The Treble. However, in the years following this, the team were in decline. After a number of changes in ownership and receiving fines for breaching the UEFA Financial Fair Play Regulations in 2015, the team were clearly feeling the effect. 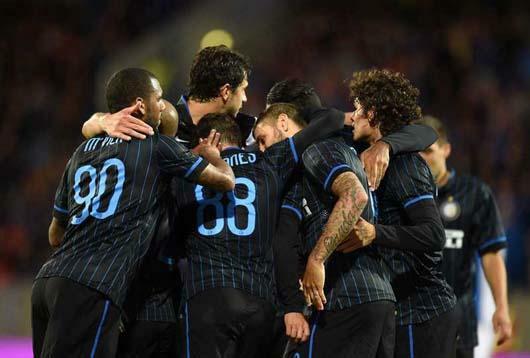 How to Buy Inter Milan FC Tickets on Ticketgum? Choose an Inter Milan game from the home and away selection. Pick where you would like to sit and how many tickets you would like. Receive your Inter Milan tickets and enjoy the game!